I wasn’t going to write anything “political” today (unless you count my tribute to the victims of the 9/11 terrorist attacks, which I guess could be political, or nationalistic, or some other horrible thing), but this one just popped into my head. You may or may not recognize the above posted figure of Ron Swanson (played brilliantly by Nick Offerman) from the television series Parks and Recreation (2009-2015). I’ve only watched certain portions of the series, but Offerman’s performance is always one of the highlights. 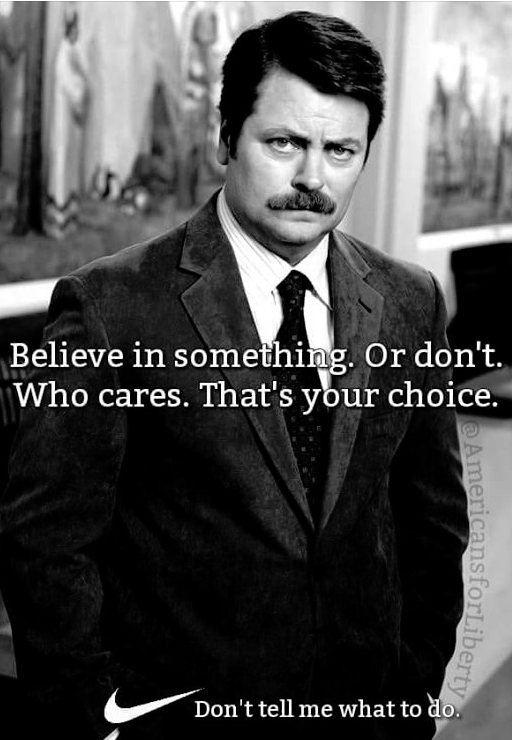 Swanson is a “dyed-in-the-wool” libertarian, almost (but not quite) to the point of caricature, which allows him to say and do the most outrageous things, get away with it, and be hysterically funny. It also allows him to say certain “truths” that people might otherwise balk at. One excellent example is when Ron explains what government is (and isn’t) good for to a little girl using her lunch (Vimeo video). He’s actually very sweet with her and it’s an endearing transaction (not so much with her mother later on). However, the point he makes above is the point I’m trying to make. Even leaving Nike and Colin Kaepernick out of it completely, the internet and particularly social media is constantly trying to grab your attention and convince you of this or that (and failing that, accuse you of being evil such that there’s no way to “win” short of surrendering your free speech rights if not your free will). 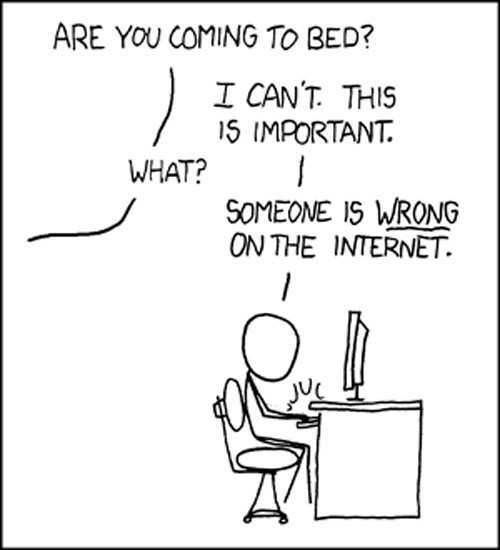 It’s pretty easy to get caught up with “someone on the internet is wrong” and engaged in these endless virtual knife fights. I periodically have to remind myself that I don’t have to show up, even when called out. In fact, going back to what I wrote in How Listening to Negative Voices Destroys Our Peace, I keep re-reminding myself that I possess the ultimate “OFF” switch. If I feel like I’m being lectured to or even (virtually) bullied online, all I have to do is close the browser tab or window and go read a book. It’s a barrier that no one online can break through. You can’t be harassed on the web if you pull the plug, so to speak. But that’s a problem for people who really, really need to convince you of the righteousness of their cause, and why you should join, and why you should listen, and why you’re bad and terrible if you don’t listen, and especially if you (gasp) disagree. Okay, that last part was kind of snarky, but I can be lambasted online only so long before I choose to either strike back in some fashion, or tune out. If you want me or people like me to be your audience, because, after all, the people who already agree with you accept your argument, so who do you have left to talk to, then pushing me and people like me too far is not the answer. 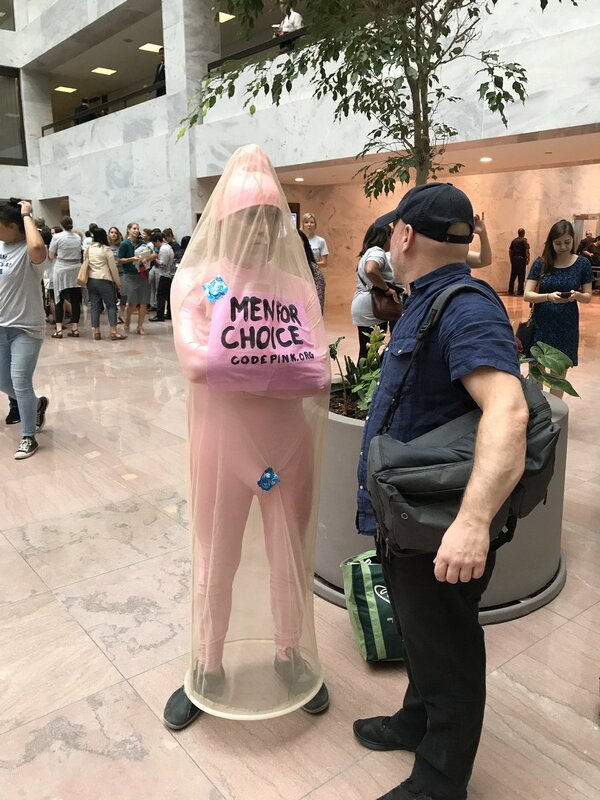 Photo of a protestor on the second day of the Kavanaugh confirmation hearings – found on twitter. In the end, a lot of us end up talking to ourselves (the groups who agree with us), and one of the reasons I listen to people and groups with differing perspectives is to understand where they’re coming from. After all, they might have a point to make. I consider myself more or less a reasonable person. I might actually learn something (and sometimes I do). So I’m willing to listen…up to a point. The point where I press your (“your” in the generic sense) mute button is where I lose any hope that (generic) you will consider me even remotely good as the person I already am. If someone tells me repeatedly that I’m a racist, sexist, misogynistic, something-phobic, Neanderthal, etc…etc…, because I was born in a systemically bad nation, and there’s no hope for me in any sense unless I repent of my evil white male ways and put on a pink hat, I’m probably going to metaphorically hang up the phone. I’m writing this as much for me (because I need to hear/read it) as well as for anyone else, but I just wanted to let certain of my critics know that I don’t always have to respond or even read your message once it crosses the line within me and trips my internal editor. Ummm… isn’t your “don’t tell me what to do” telling me what to do? So far, this essay and its replies have not considered the role of proper authority and its boundaries and the individual’s responsibility to comply with its purpose to ensure some degree of order and reliability for a society. The alternative of anarchy is sometimes attractive but its ultimate results are not pleasant. Now, folks on the internet are not authorized, and may be ignored. Their only potential claim upon any reader is to be found in the strength of their ability to indicate the value of their words, by logic or by appeal to recognizable authorities, for example. Someone like the Ron Swanson character appears merely to complain about the shortcomings of a system where the boundaries may need to be readjusted. Another such as Kaepernick may merely symbolize rebellion and disrespect. None of them represents the proper place of authority or a proper response to it. I think it important to remember and to emphasize that proper authority has boundaries, and within them it provides benefits to those who honor it. Consequently, there are some who are authorized to tell us what we may or may not do, and there are many others who may not. Wisdom, and peace of mind, consists of learning to recognize who is whom. I’m not speaking of proper authority, which I had hoped I had made plain. However, the internet can convince some that they have entitlement to indoctrinate instruct others of how to behave and even to how to think, and if we don’t then their recourse is to use insults. I’m merely pointing out that their effectiveness is an illusion and they can be turned off as easily as a television set.